Thank God I’m not thin. I would spend WAY too much money on clothes. This is just an excuse. It’s one of the many lies we tell ourselves that keep us fat. The last time I lost a substantial amount of weight, I had this anxiety. None of my bras fit. My pajamas didn’t fit. My swimming suits were huge and floppy. It spawned a HUGE freakout and I gained all the weight back. Now that I’m at that same weight as the last freakout, I can feel myself having it again. This time, it was the swimming suits. My bras had been so old that I NEEDED new ones, so they didn’t bother me. Pajamas are for sleeping, so the fact that they are too loose wasn’t a big deal. Swimming suits, however, are essential when I need them and I was caught off guard by the fact that mine are too big. There was only one top and one bottom that could adequately cover me without threatening to fall off. 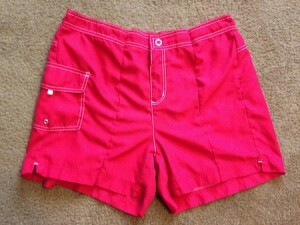 Even the board shorts that I altered last year were too loose. For some strange reason, this made me want to binge. Shouldn’t clothes that are too big for me make me HAPPY?! Shouldn’t they be a reason for rejoicing?! Instead, it caused a freakout, but this time, I vowed to move beyond the freakout instead of letting it get in my way like last time. I altered some of my old swimming suits so they would fit and I bought a few new ones. Since it’s so late in the season, most of them were on clearance and there were a few left in my size. This time, the disaster was averted. I was worried that I would be naked or have to spend “too much money” on new ones. Until I am able to decimate the idea that being thin will cost me too much money, I will still have this problem. And, it’s such a stupid idea. Being thin is CHEAPER than being fat. Firstly, I’m not shoveling tons of food down my throat, so I save that money. Secondly, thin clothes are less expensive than plus-sized clothes. Thirdly, I will spend less money on health care in the future because I’m closer to a healthy weight. Finally, since I’m not gaining and losing over and over, I don’t need to replace my wardrobe every time I “get it under control.” My clothes actually have the time to wear out now. 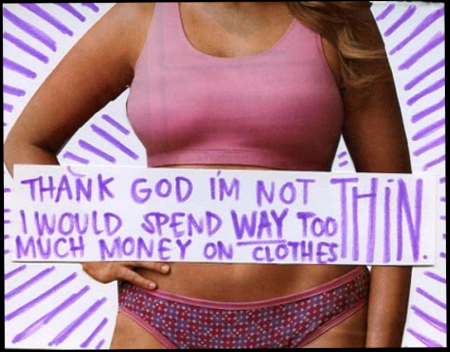 The next time you feel that tiny burst of gratitude that you aren’t thin because you think you would spend too much money on clothes, remember that being thin is CHEAPER than being fat in every possible way.